This museum building comprises three wings linked in an E-shape at the entrance side and a cylindrical tower crowned by a zinc dome, like a beacon on the Maas. Inside, the entrance hall is dominated by a telescopic toplit space. On axis with the entrance hall is a monumental flight of stairs wedged between two 14 metre high brick walls. The exhibition spaces upstairs are more traditional with a fine focus on daylight penetration. 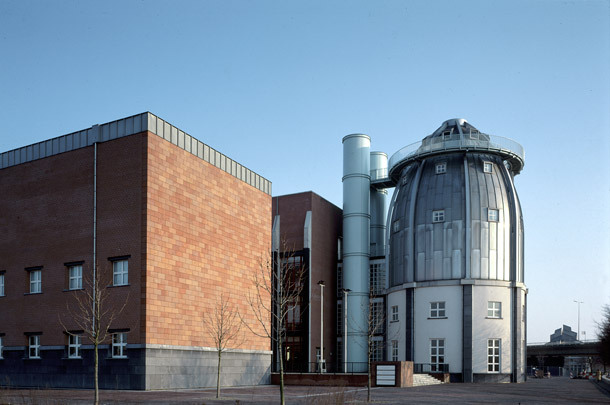 Rossi’s architecture refers back to Maastricht’s Roman past and the site’s former industrial function.